This paper investigates factors influencing public transport passengers’ pre-travel information-seeking behaviours in a British urban environment. Public transport traveller surveys were conducted to better understand the journey stages at which information was sought and the information sources used. A multivariate explanatory model of pre-travel information-seeking behaviour was developed using binomial logistic regression. Explanatory factors considered include socio-demographics, trip context, frequency of public transport use, information sources used, and smartphone ownership and use. Findings suggest that travel behaviour (5 + trips weekly, and < 1 trip weekly), socio-demographics (unemployment/unknown employment), trip context (journey planning stages, mode of transport), and preferred information sources (Internet site, word-of-mouth, visits to travel shop/centre/library) were significant predictors of pre-travel information-seeking behaviours among surveyed travellers. While the final model found that bus users are significantly associated with the use of Internet sites as a source of pre-travel information, rail users rely significantly on a multiplicity of sources comprising Internet sites, word-of-mouth, and visits to a travel shop/centre/library. The final model suggests that metro (light rail) users tend not to seek pre-travel information. The odds of seeking pre-travel public transport information are 2.512 times greater for respondents who reported < 1 trip per week as opposed to those who reported 5 + trips per week. These findings are relevant for passenger information strategies deployed by operators and authorities and can be used to caution against a “one size fits all” strategy for travel information service provision. Implications and suggestions for future research are discussed. An earlier version of this paper was presented at the 97th Annual Meeting of the Transportation Research Board, January 2018. Despite on-going attention to the ways in which information is made available to public transport passengers, in many places the use of such information by travellers can be relatively low, suggesting that merely making information available does not necessarily lead to its use (DfT 2007; Burkhard et al. 2013). This gap would imply that we need to better understand associations between public transport users and available information sources in order to improve how information is conveyed and better confer its benefits to users of public transport services (Farag and Lyons 2012). Understanding pre-trip travel information-seeking behaviours has the potential to guide government agencies as well as businesses, such as public transport service providers and tourism bureaus, to make effective decisions regarding service delivery and how and where to spend marketing budgets (Farag and Lyons 2010, 2012; Kambele et al. 2015). Additionally, a successful travel information-seeking strategy can offer advantages to the traveller and the information provider, and enhance the information delivery process. Advantages to travellers would include, for example, the ability to identify unknown travel options from the onset as well as along the journey. Information providers, in turn, might be able to better understand what people search for and when, and how it affects their travel behaviour, which could lead to improved service delivery as well as enhanced budget allocation strategies. This paper examines information-seeking behaviours of public transport passengers and seeks to advance the existing empirical evidence base using data collected as part of an extensive public transport survey conducted within a major conurbation in England. The analysis addresses the following questions: where do public transport passengers seek information? At what stage of the journey do they seek information? Are there particular user characteristics that contribute to these behaviours and, if so, how may these impact upon decision-making by public transport operators? Using a multivariate binomial logistic regression model, factors related to socio-demographics (age, employment status, gender, driving license, household car ownership), the trip context (trip purpose, journey planning stages, preferred mode of transport, payment method), public transport trip frequency, preferred information sources when using bus/rail/metro, smartphone ownership and use (including the availability of mobile data services and concerns about data allowance/usage), and their relationship to pre-travel information-seeking behaviour are examined. It is anticipated that the findings will contribute to the development of effective strategies for enhancing the pre-travel information-seeking experience among public transport users in the study area, as well as how they may inform decision-makers in other urban areas where similar user/infrastructure characteristics exist. The paper is structured as follows: the next section reviews relevant literature, followed by a discussion of the methodology employed in the study. Results and discussion are followed by a summary of key findings along with suggestions for future research. Pre-travel information in a public transport context is generally aligned with information sought before the trip is made in order to ensure a smooth journey, which at its simplest may be described as what opportunities are available for the journey that the traveller would like to make and (ideally) how much it will cost (Nelson 2018). Lyons et al. (2007) cite a study which found that, “Eight categories of essential pre-travel information were identified and considered applicable across all modes (while acknowledging varying importance across disability groups): staff assistance…; physical accessibility of stops; physical accessibility of vehicles; help facilities; stop facilities; timetable and service communication methods; lighting; and surfaces (Lyons et al. 2007)”. While the Lyons et al. study focused particularly upon persons with disabilities, the information sought is indicative of the types of information that may be useful for persons as they plan a trip. The category of information preferred by public transport passengers varies by mode and by journey segment (Lyons et al. 2007). Existing studies have shown that travel behaviour and socio-demographics have the strongest influences on pre-travel information-seeking behaviours (Farag and Lyons 2010, 2012; Kambele et al. 2015). While Kambele et al. (2015) show significant differences between developing and developed countries (China versus USA), with the Chinese preferring word-of-mouth recommendations and Americans relying heavily on the Internet, Farag and Lyons (2012) suggest that word-of-mouth recommendations appear to still be relevant among public transport users in the United Kingdom. The studies by Farag and Lyons (2010, 2012) appear to be among the few that tend to use a multivariate explanatory model, rather than the use of descriptive statistics, or bivariate statistics (e.g. Kambele et al. 2015), to explain pre-travel information-seeking behaviours. They examined long distance business/leisure journeys while comparing cars with public transport for unfamiliar trips and found that travel behaviour and socio-demographics were significant predictors. Unlike descriptive studies (Mulley et al. 2017; Cain 2007), the use of multivariate explanatory models provide a better (although not absolute) explanation of pre-travel information-seeking behaviours by combining different variables. The shift from traditional travel information sources (e.g. print, word-of-mouth etc.) to on-line sources is well researched and documented within the context of journey planning and travellers’ information-seeking behaviours (Kambele et al. 2015; Cain 2007; Fodness and Murray 1997; Beldona 2005; Kim and Law 2015; Bonn et al. 1998; Weber and Roehl 1999; Lyons 1999; Kim et al. 2015). The marriage of travel planning and the Internet has been extensive (Beldona 2005; Kim and Law 2015). Increased availability of Information and Communication Technologies (ICTs), such as smartphones and other mobile devices with Internet connectivity, has significantly impacted upon the available options for seeking information before and while making a journey by public transport. Significant investment has been made by transport service providers and developers in resources, such as web-based services for multi-modal end-to-end journey travel information (e.g. traveline.info in the UK and http://511.org in San Francisco), as well as smartphone-based travel planners [including Moovit (http://moovitapp.com), Citymapper (http://citymapper.com), and MyJrny (http://enableid.com/myjrny)]. In addition, Google Maps (http://maps.google.com) has become a standard mechanism for obtaining public transport information across a variety of internet-connected mediums. While the general use of web-based services for travel planning has been studied extensively over the past two decades (Bonn et al. 1998; Weber and Roehl 1999; Lyons 1999), more recent studies have aimed to progress detailed understanding of their use with more targeted populations [e.g. a generation level study (Kim et al. 2015)]. There are also emerging studies on the use of smart mobile devices and social media in public transport journey planning contexts. 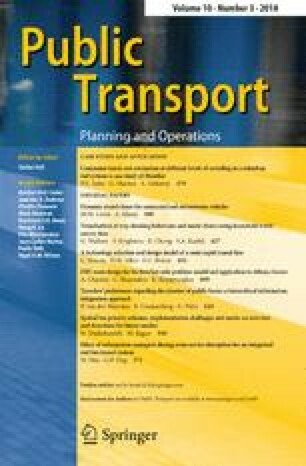 A European study on options for supporting the development of Cooperative Intelligent Transport Systems (C-ITS) suggests that the deployment of personalised ITS sub-systems (using smartphones and personalised navigation devices like Tomtom) could have immediate benefits (Asselin-Miller et al. 2016). Investigation of the use of smart mobile devices for journey planning is timely, as other research has shown that smartphone-based real-time information reduces the actual and perceived wait times experienced by transit riders (Watkins et al. 2011; Chowdhury and Giacaman 2015); and can assist with trips in unfamiliar areas (Chowdhury and Giacaman 2015). There are also emerging studies on the use of smart card data for bus arrival time computation enhancement (Zhou et al. 2017), and for understanding passenger-to-rail assignment and crowding cost to develop business cases and inform pricing policies (Hörcher et al. 2017). It has been shown that existing travel information systems in the UK, Sweden, and Germany tend to be biased towards planning in the pre-travel stage of the journey, leading to limited functionalities on the on-trip/in-trip as well as post-trip stages of the journey (Kramers 2014). There is also evidence that public transport service providers are increasingly considering dissemination of travel information to travellers via social media platforms where there is the possibility for information exchange in a trusted, accurate, transparent and open manner (Cottrill et al. 2017). While the above studies demonstrate that there is great interest in the provision of and access to information along public transport journeys, there is currently inadequate empirical evidence of the ways in which users access this information, and at which stages of their journey. In this paper, we contribute to addressing this gap by conducting a large-scale on-board survey of public transport passengers and their habits regarding information-seeking. Particularly given the rapid emergence of smartphones and other personal devices for obtaining information, developing a more evidence-informed understanding of who uses (or does not use) such resources is a critical component of developing information provision strategies that best serve the needs of public transport passengers and potential passengers. This study contributes to the research evidence-base within the British context by addressing the gap in knowledge relating to the pre-travel information-seeking behaviours of everyday public transport users, which takes account of preferred information sources and use of technology for seeking information as well as journey planning stages. The Birmingham study area (the major urban centre in the UK’s West Midlands area) is discussed further below. Based on the reviewed literature and the results of 5-year interval public transport surveys commissioned by Transport for West Midlands1 (TfWM), an initial travel survey instrument was developed for this study. The TfWM surveys were designed to capture a representative profile of public transport users throughout the West Midlands based on socio-economic characteristics and travel behaviour (TfWM 2015). The TfWM Rail surveys were conducted in 2008 and 2013, and covered 68 rail stations. The TfWM Bus and Metro surveys were conducted in 2009 and 2014. The former were conducted on-street at 49 key points while the latter were at all 23 metro (light rail) stops. However, pre-travel information-seeking behaviours were not specifically captured in the TfWM surveys. In order to capture the pre-travel information-seeking behaviour for use in the study reported here, on-board and intercept survey techniques were employed as they are a cost-effective way to gather information from riders in major cities (Schaller 2005; TCRP 2017). While an on-board travel survey is a standard method, the mechanics of conducting an on-board survey will vary widely with respect to the population being studied, geographic location of interest, mode availability, nature of public transport infrastructure and service, and primary topics of concern. Socio-demographics. This section asked about age, gender, employment status, driving license, household car ownership, and the first four/five characters of their postcode. In addition to the development of the survey instrument, it was also necessary to address several issues related to the methodology for conducting the survey. These included: sample size; method, days and location of survey administration; and agreement of transport operators. On-board public transport surveys may be conducted at various times, e.g. Tuesday–Thursday and Saturday (TfWM 2015) or Monday–Friday (ARC 2010). To gather information on both typical and atypical travel days, the current survey was administered over both weekdays and weekends. As people tend to seek travel information more often for unfamiliar trips, the strategy was to ensure that an adequate number of these types of trips were captured. With respect to sample size consideration, the ‘2015 West Midland Travel Trends’ reported that Birmingham had 275.1 million bus journeys, 50.8 million rail journeys, and 5 million metro journeys. Using this reported number of journeys and aiming for a 99% confidence limit (CL) with a confidence interval (CI) of ± 7%, the present survey sample size would require surveys of 340 journeys on each mode. The survey instrument was designed as a self-completed paper instrument that was given to all willing adults entering the public transport vehicle or passing by the survey staff at New Street Station. Surveys were then collected upon departure or completion by the locally recruited survey staff. The survey length was kept compatible with such an approach, aiming for an average completion time of 10 min; this was influenced by the UK Department for Transport estimated average minimum travel time (15 min) by public transport in urban areas in England (DfT 2015a), while Birmingham, in particular, was 14.1 min (DfT 2015b). Findings from the think-aloud survey and on-board pilot test confirmed that the length of the survey was appropriate. Agreement of transport operators3 was confirmed prior to finalisation of the routes to be surveyed. Specific survey locations were chosen based on factors including areas of geographic interest; communication with companies responsible for route operations and management; and spatial balance of survey origin and destination locations. While permission was sought but not obtained to survey on-board trains, approval was granted for surveyors to distribute and collect surveys at New Street Rail Station, a key hub of rail activity for the Birmingham and West Midlands area. 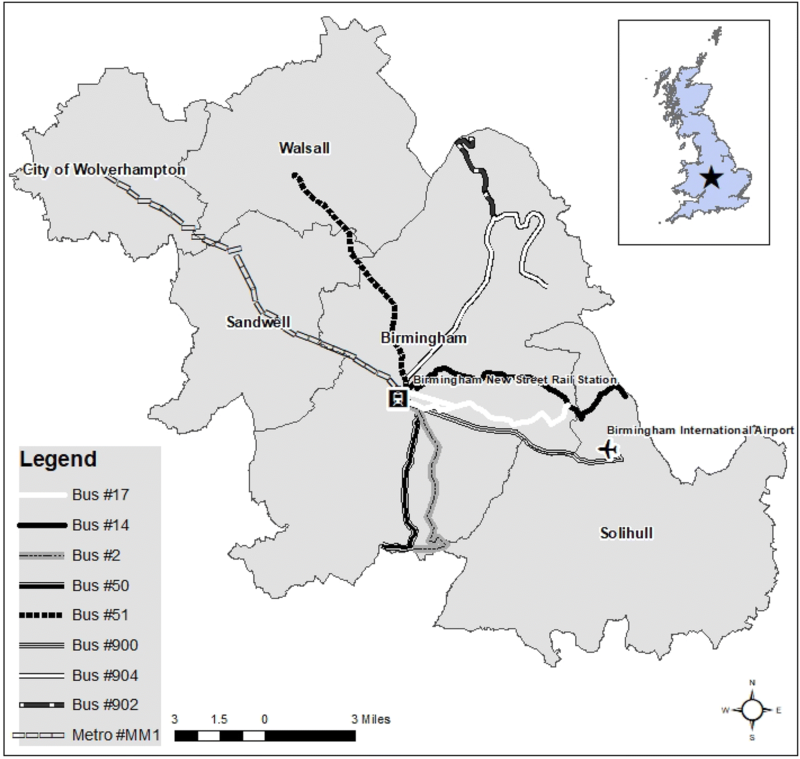 Figure 1 shows surveyed bus and metro routes, as well as the location of Birmingham New Street Station, where rail surveys were undertaken. The survey was conducted from Monday, 10th October 2016 to Sunday, 23rd October 2016, excluding the 10th, 14th, and 17th. The survey returns totalled 907, of which 360 were from metro, 318 from bus, and 229 from rail. Although the target threshold of 340 returns was not met for bus and rail, these totals (at least 99% CL and ± 8.52 CI) do provide adequate coverage for analysis of public transport users within Birmingham overall. Completed paper surveys were entered into a survey database created in SPSS. Quality control was undertaken by randomly selecting 20% of the surveys entered and re-checking the database entries against the hard copy surveys by performing an initial descriptive analysis where any indication of a missing value for each variable is traced and double-checked. The distribution of all survey returns by date and time is shown in Table 1. Surveys undertaken at the railway station were delayed while a final distribution location was determined, and some dates were not surveyed based on surveyor availability, or due to fulfilment of the targeted response. Table 1 indicates that for all the modes, more survey responses were obtained in the afternoon than in the morning or evening hours, which may be attributed to people being more likely to complete a survey during non-peak hours (e.g. when they were not rushing to work or going home). Walkit, which allows customers to plan walking journeys, including ones aligned with public transport journeys. Public transport information is available at the regions’ travel centres, located around the region. In addition, paper timetables are widely available at public transport stops and stations. The variety of information resources available provide an indication of the ways in which passengers may access information throughout their journey, though the timeliness of information provided may be subject to the method by which it is obtained. For the remainder of the paper, “primary sample” refers to the Birmingham survey sample. To give an indication of the representativeness of the sample it was compared with the earlier TfWM travel survey (Table 2). Table 2 shows the relatively small numbers of once-a-week use of public transport in all the surveys. In the TfWM 2014/2009 surveys, bus users were typically female; a similar trend was found in the primary sample. However, in the case of metro users, while there were more males in the 2014/2009 surveys, the primary sample includes more female metro users with the remainder preferring not to say. There were more females (57%) than males in the 2013/2008 rail survey and more males (53%) in the primary sample. The trend in the primary sample suggests the use of Internet sites as the first preference for information source for all modes. Rail riders, in the 2013/2008 TfWM survey also used Internet sites as an information source more frequently than checking timetables at stops. While bus and metro travellers in the 2014 TfWM survey used Internet sites as an information source less frequently in comparison to checking timetables at stops, the primary sample exhibited an opposite trend. Smartphone ownership is over 50% in the study area in all the surveys (Table 2). Such results provide a useful demonstration of the variety of locations and journey stages at which information may be sought, while revealing that static locations are currently still the most common. This may also be a reflection of patterns of trip frequency and purpose, as shown in Table 3, which reports weekly trip frequencies by purpose for those persons who indicated that they travel at least once per week by the relevant mode. The data indicate that those persons who use public transport most frequently (in particular, those who use one of the modes studied 5 or more times per week) tend to do so most often for work or education purposes, which generally have consistent patterns in locations and times. The bus is seen to be the most common form of travel, which is likely related to the survey parameters, but also reflects the general coverage of bus services contrasted with rail or metro. These results are also consistent with the information sources reported above, which tend to be convenient for persons seeking information from a static point, or while waiting for a vehicle to arrive. To explore further relationships between the variables shown in Table 2, a series of crosstabulation analyses with Chi square tests of independence were run. The method of information-seeking on the day of surveyed travel was examined in relationship to age, gender, number of trips taken per week, and trip purpose. While there was a large number of respondents (590 of 907) who indicated that they had not sought information prior to the surveyed trip, overall results indicated that for those who had there is a significant correlation with smartphone ownership (0.002) and number of trips per week (0.000). These initial findings will be explored in more detail in the analysis below. Goodness-of-fit statistics are usually used to determine whether a model adequately describes the data. In binomial logistic regression, the Hosmer–Lemeshow test indicates an adequate fit when the significance value is more than 0.05. Similar to the linear regression model, the coefficient of determination, R square (R2), summarizes the proportion of variance in the dependent variable associated with the independent variables, with larger R2 values indicating that more of the variation is explained by the model, to a maximum of 1. In the case of binomial logistic modelling, R2 approximations are computed instead in the form of the Cox and Snell R2 and Nagelkerke R2. The latter is used in this study as it is a better approximate of the former; the former does not reach its theoretical maximum of 1 (Field 2009). All the explanatory variables used in the regression model along with the associated coding scheme and initial variable entry order in the initial model are shown in Table 3. The subsequent list of variables used in the final model, after the application of the forward likelihood ratio selection method and backward likelihood ratio elimination method, are also enumerated. One other interesting feature in using binomial logistic regression is that the technique allows for comparison between one category of an explanatory variable and the remaining categories. This means that for each independent variable, one of its categories must be used as a reference in the model such that all other categories can be compared to it. Additionally, the contrast method selected is termed as “Simple” in SPSS which allows each category of the explanatory variable (except the reference category) to be compared to the reference category. In Table 4, reference values are indicated with an asterisk (*). The determination of the final model of pre-travel information-seeking behaviour, based on the goodness-of-fit statistics from the Hosmer–Lemeshow test, indicated an adequate fit since the significance value was 0.476. Moreover, the final variables presented in Table 4 are those that were considered relevant after applying both the forward likelihood ratio selection method and backward likelihood ratio elimination method to the variables listed in Table 4. The final estimate of the coefficient of determination, using the Nagelkerke R-square (R2), was 0.304; suggesting that the final explanatory model explains approximately 30.4% of pre-travel information-seeking behaviour among public transport users in Birmingham. While this being a useful contribution, future work should explore additional explanatory variables. Characteristics of an individual’s travel behaviour have a significant effect on their public transport pre-travel information-seeking behaviour. Trip frequency rates that had particular relevance to pre-travel information-seeking behaviour were public transport users who usually take “< 1 trip weekly” and “5 + trips weekly”. The odds of seeking pre-travel public transport information are 2.512 times greater for respondents who reported < 1 trip per week as opposed to those who reported 5 + trips per week. This is consistent with other studies that have shown that differences exist between passengers making frequent versus infrequent trips (Mulley et al. 2017). Among all the socio-demographic variables considered, the employment status variable had a significant effect on pre-travel information-seeking behaviour. Respondents who are unemployed (including those with unknown employment status) were found to be significantly more likely to seek pre-travel information (1.754 times greater for unemployed respondents than for employed respondents). Employment status may also be related to the number of trips undertaken per week, as commuters may make more regular trips by public transport (Table 5). The model results suggest that trip context (specifically, all journey planning stages except for plan at station/stop/on-board) and preferred mode have a significant effect on pre-travel information-seeking behaviour. This finding provides further support to Mulley et al. (2017), who suggested that public transport users do identify a variety of information needs at different stages of their journey. The odds of searching for pre-travel public transport information are 0.553 times less for respondents with a smartphone who typically plan their journeys at locations other than at home/work/station/stop/on-board (for example, while travelling to their next mode of transport or undertaking other activities) as opposed to those with a smartphone who typically plan their journeys at home/work. The likelihood of respondents who do not own a smartphone to seek pre-travel information is less than those who do own a smartphone. Surveyed rail users tended to seek pre-travel information more often than both metro and bus users; this is likely due to the respondents making infrequent rail trips (as seen in Table 3) or the perceived reliability of service. Although all three modes played a major role in predicting pre-travel information-seeking behaviour, rail and bus modes played a more significant (p < 0.001) role than metro (p < 0.05), perhaps aligned with real or perceived reliability of service, as discussed above. The odds of seeking pre-travel information are 5.514 times greater for rail users as opposed to bus users. Moreover, the likelihood of seeking pre-travel information is 0.633 less for metro users as opposed to bus users. The model results suggest that while rail users used Internet sites for seeking pre-travel information, they also tend to visit travel shops, or an information centre or library, together with using word-of-mouth (asking inspector/friend/relative/other passenger, etc.). The odds of seeking pre-travel information are 6.684 times greater for respondents who visit a travel shop/centre/library to seek rail information, as opposed to those using an Internet site. All metro information sources did not play a major role in explaining pre-travel information-seeking behaviour in the final model, but the descriptive statistics in Table 2 showed an Internet-led trend. This might be due to the relative simplicity of Birmingham’s metro system’s locations and service timings (see Fig. 1), or the integrated approach to travel planning encouraged by Transport for West Midlands. The use of Internet sites to search for bus information was statistically significant (p < 0.01) in the final model, suggesting that strategies to enhance bus information provision cannot overlook Internet site usage. The likelihood of seeking pre-travel information is about 0.48 times less for non-seekers of bus information as opposed to those using an Internet site for bus information. Overall, the descriptive statistics and model results point to the importance of an Internet-led information provision model for public transport users. This means that attention to Internet-enabled technologies and infrastructure for information provision is paramount. However, when targeting travellers for marketing purposes, it is best if transport operators or authorities segment travellers to better understand their needs. Data-driven segmentation of passengers by way of understanding their individual socio-demographics can be hindered due to data privacy issues and personal security issues, which need to be taken into account. Beecroft and Pangbourne (2015) suggest that there is a general ignorance of public transport operators regarding characteristics of their customers, indicating a lack of a targeted approach to information provision. As detailed above, information-seeking differs between bus, rail, and metro users (likely as a consequence of service characteristics) so developing a clearer understanding of these characteristics will allow for more tailoring of services. The main purpose of this study was to examine pre-travel information-seeking behaviours of public transport passengers using data collected during an extensive public transport on-board survey in Birmingham. This empirical study considered explanatory variables comprising smartphone ownership and use, information sources, trip frequency, trip context, and socio-demographics. Together, the results show that trip frequency (5 + trips weekly, and < 1 weekly trip), socio-demographics (unemployment including those with unknown employment category), trip context (journey planning stages, preferred mode of transport), and information sources (Internet site use by bus/rail users, word-of-mouth by rail users, visiting travel shop/centre/library by rail users, not searching for bus information) were significant predictors of pre-travel information-seeking behaviours among public transport users in Birmingham. Overall, these findings could have several implications. First, they imply that, where limited budgets exist, public transport information service delivery strategies should not target the entire population of public transport users, but rather focus on understanding segments of the population. This means that customised solutions are likely to lead to differentiated markets in public transport information service delivery. For example, the preferences of rail/bus users need to be considered carefully by service providers and transport authorities, as their preferences differ. While bus users are likely to use Internet sites as pre-travel information sources, rail users tend to use a multiplicity of pre-travel information sources comprising Internet site, word-of-mouth, and visits to travel shop/centre/library. In terms of investment strategies and budget allocations, it might be best to invest more in pre-travel information service delivery to rail and bus users than to metro since the majority (about 57%) of metro users do not seek pre-travel information (although the simplicity of the Midland Metro network must be acknowledged). Additionally, the number of metro riders who do use the information sources did not have a statistically significant effect in the final model. Passenger information strategies deployed by operators/authorities may be used to caution against a “one size fits all” strategy for travel information service provision. Particularly in areas characterised by infrequent use of public transport or where public transport services are perceived as unreliable, provision of targeted, multi-platform information will be necessary to meet the needs of consumers. Second, the journey planning stages (planning at home/work, planning at other location) variable was found to be a predictor of pre-travel information-seeking behaviour. The odds of searching for pre-travel public transport information are 0.553 times less for respondents with a smartphone who typically plan their journeys at locations other than at home/work/station/stop/on-board as opposed to those without smartphone who typically plan their journeys at home/work. The likelihood of seeking pre-travel information is about 0.261 times less for those who disclosed no information about their journey planning stages as opposed to those who plan a journey at home/work. This shows that pre-travel information-seeking is not necessarily about who has access to a smartphone, although owning a smartphone is an enabler. The non-significance of the on-trip/in-trip journey planning (i.e. planning at station/stop/on-board) in the final model might well be linked to the fact that public transport information systems tend to be biased towards the pre-travel planning part of the journey—leading to limited functionalities on the on-trip/in-trip of the journey, as shown in Kramers’s (2014) study. Third, although there were indications of mobile app use, smartphone ownership and use (as defined in Table 4) did not have a significant effect on pre-travel information-seeking behaviour. This was contrary to the authors’ expectations, given that initial analysis found significant (p < 0.01) bivariate association between pre-travel information-seeking behaviour and smartphone ownership. Despite a high level of smartphone ownership (88%), the model did not show that mobile app use was a significant predictor for pre-travel information-seeking. Given that emerging transport solutions are being conceptualised around smartphone-based technological possibilities (Mulley 2017; TSC 2016), the expectation is that mobile app use (and implicitly smartphone use/ownership) for sourcing pre-travel information will likely become a significant predictor of pre-travel information-seeking behaviour in the future in the study area. Fourth, this study is not without limitations. For example, it did not address more complex multi-modal journeys, considered as a trip chain (Currie and Delbosc 2011; Park 2017). The survey was designed and administered in the English language, meaning that the current study might not have captured linguistic minorities similar to the Farag and Lyons (2012) study where linguistic minorities were excluded. The developed explanatory model could explain approximately 30.4% of the phenomenon (pre-travel information-seeking behaviour) suggesting that, like previous studies reviewed, more explanatory factors need to be explored in future studies. The indicators of representativeness of the primary sample need to be considered in terms of interpretation and generalisability. While gender statistics for bus users in the primary sample (2016) appeared to have a similar trend to the previous TfWM Bus survey (2014/2009) with females being more represented than males, gender statistics of metro/rail users in the primary sample appeared not to be the same as the previous Metro/Rail surveys (2014/2009 or 2013/2008). Finally, given that both users and non-users of smartphones were found, in the final model, to search for pre-travel information, further research could separately focus on smartphone users who use public transport. For example, future research could examine determinants of smartphone-based travel information searches to provide insights of smartphone use from a public transport perspective. Further work should also be conducted to explore the differentiation between “on-demand” and “real-time” information, which may have substantially different characteristics in terms of accuracy and in the context of public transport services with varying perceptions of reliability. These explorations could further enhance understanding of the use of smartphones for travel information search given their growing dominance. Additionally, it is suggested that empirical work could also consider investigating the economic implications of pre-travel information-seeking behaviours from either a user’s or operator’s perspective. The public body responsible for co-ordinating transport services in the West Midlands. Choice of pilot location was due to proximity of research team. The surveyed bus routes are operated by National Express West Midlands. While the metro service was run by National Express Midland Metro at the time of the survey, operations were taken over by Midland Metro Limited (MML) in June 2018. The work described here was supported by an Innovate UK award to the SmartRouting project (Grant reference—102615). We acknowledge members of the SmartRouting consortium who have provided advice and support for this work: Pascal Simplice (Ayoupa Ltd); Nikki Spencer (Birmingham City Council); Ben Stewart, Max Stewart, Flora Bowden and Christine Fent (Caution Your Blast Ltd); Dr. Rafael A. Cepeda and EngD Darminder Ghataoura (InterDigital Europe Ltd). We would like to thank all anonymous participants who helped in collecting the primary sample for this research. We acknowledge support from the following transport operators during the field survey: the Midlands Metro, and Transport for West Midlands (TfWM—formerly Centro), National Express, Network Rail, and FirstGroup plc (Aberdeen).